A Folk-Country flavored Comedy duet; conversations you might hear in Suburbia. 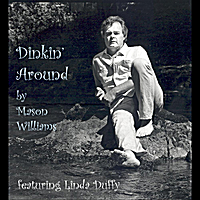 I heard the words "dinkin' around" at a party at Winthrop Rockefeller's summer cabin resort in the back woods of Arkansas. In a conversation between a woman (his mother) & a young boy, she said to him, "What are you doin', just dinkin' around?" He said, "yeah." It implied just hanging out & doin' whatever you want. At homes it could be little household chores you enjoy doing, or pet personal projects, you might, for example, go through your wallet & straighten out all the corners of the bills, making sure they all face the same way...and put them in denominational order. ...Sort all your CD albums into categories...jazz, blues, pop, classical, etc...Cut the little lint balls off your sweaters. Everybody has their own personal favorite "dinkin' arounds"; what are yours?